The new Height Rider 17N (HR17N) will lift 2 men and their tools to a working height of 17m or a working outreach of 9.7m. Its useful 180° rotating cage and fly-boom coupled with fully proportional multi-function controls deliver exceptional precision when positioning, making tasks easier and quicker to complete. 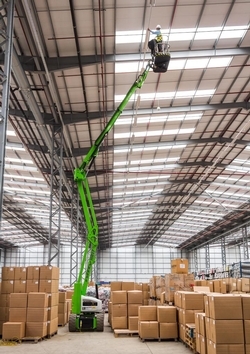 The HR17N also incorporates Niftylift's ToughCage, and multi-award winning SiOPS® safety system which eliminates sustained involuntary operation by instantly halting machine movement if the operator is pushed against the control console. The HR17N's 1.5m width and sub 2m height enables travel through restricted spaces. Optional non-marking tyres mean that it can work both inside and out making it ideal for maintenance or industrial work. The HR17N is available with two power options. You can chose from a super-efficient battery-only power system, or Niftylift's revolutionary Hybrid power system, delivering the ultimate combination of environmentally conscious efficiency and performance.